Well it's time for another challenge on the Whimsy challenge blog "Anything Goes". That is pretty straight forward , I hope to see you make a creation and enter it on the Whimsy challenge blog for a chance to win some really wonderful digi's from some very talented designers. Click here to check out some other fabulous creations from Whimsy's digital design team. 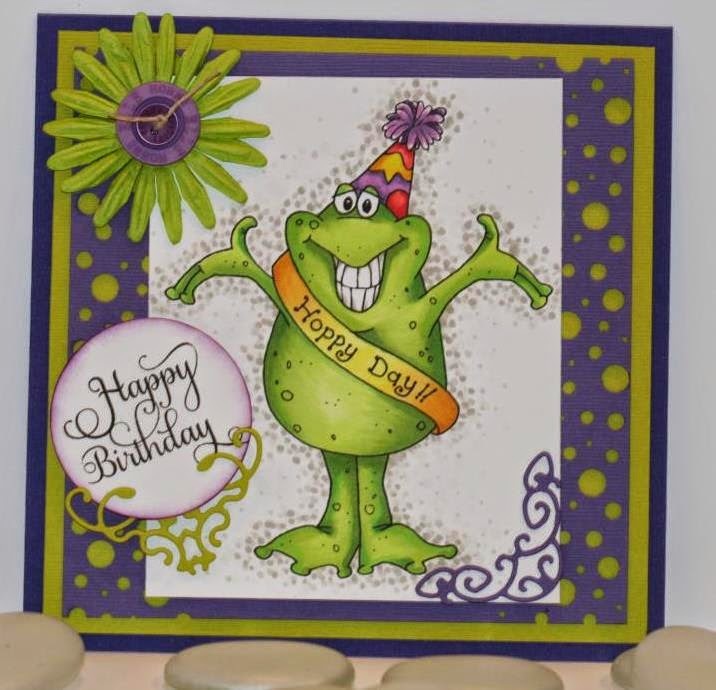 The card I created for the challenge is made from a super digital image called Froggie Hoppy Day from designer Crissy Armstrong found at Whimsy Stamps. I colored him with copic markers and added some fun whimsical dots around the outside of the image. The purple and green colors I used work well together, bright and fun for a birthday card for anyone. I hope to see you add a creation to the Whimsy blog and I really look forward to seeing what you have created. Great job, love the colors and the froggie...is supper cool....nice touch with that flower too....awesomeness! Your card is beautiful Charlene, I love the cute image it just brought I smile to my face. Beautiful embellishments.